A showdown is shaping up in Washington over must-pass legislation to fund the Department of Homeland Security (DHS) for the remainder of this fiscal year. In January, the House of Representatives approved a $39.7 billion Appropriations measure that includes provisions that would block funding to implement a massive, unconstitutional amnesty program for illegal aliens announced by President Obama in November, or to expand a previous executive amnesty program for illegal aliens who entered the country as minors. In the Senate, Democrats succeeded in preventing similar restrictions from being included in that chamber’s version of the DHS spending bill and have made it clear they would rather see DHS’s funding lapse later this month than accept limits on the president’s ability to implement his amnesty program. 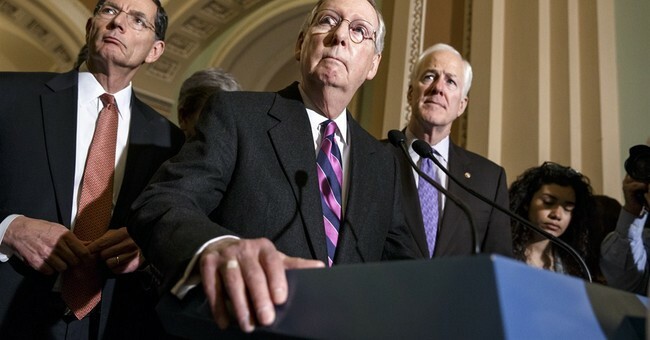 As the February 27 deadline for funding DHS approaches, Senate Democrats sent a letter to Majority Leader Mitch McConnell (R-Ky.) warning that “DHS funding should not be tied to divisive political issues,” such as blocking the president’s overtly political executive amnesty plan. Instead, they, along with the president, are demanding a “clean bill” that places no restrictions on how DHS funds are spent. Amping up the divisive game of political chicken, the president is preemptively charging that unless the Republican led Congress gives in to his demand to unilaterally grant amnesty to illegal aliens it is they who will be responsible for impeding the operations of the department at a time of heightened threats to the nation’s security. Besides the obvious fact that it takes two to create an impasse, it is the president’s immigration policies that constitute a far greater risk to homeland security than the partial DHS shutdown that would result from a failure to enact a spending measure. Implementing the president’s executive amnesty would require the diversion of enormous fiscal and manpower resources from DHS’s primary responsibilities – namely, securing the homeland and enforcing our immigration laws — to processing (or, more likely rubberstamping) millions of applications for amnesty and work authorization. Moreover, this massive reallocation of resources to fulfilling the president’s political agenda would take place at time when both domestic and international intelligence experts are publicly warning that the threat of a terrorist attack is as great as it has been since 9/11. An additional threat is posed by the near certainty that any mass amnesty program would result in the legalization of people who pose serious security risks to the United States. Dianne Feinstein (D-Calif.), one of the signatories of the letter to McConnell, warned recently, “I think there are sleeper cells not only in France but… in our own [country].” By definition, sleep cells include people who are not on our radar scope. There is little chance that these dangerous individuals would be flagged by the perfunctory background checks that would be carried out on the estimated 5 million illegal aliens believed to be eligible for amnesty under the president’s edict. No one wants to see any of DHS’s functions interrupted by a budget stalemate. Despite overheated rhetoric by the president and others, however, such a scenario would have little effect on national security. Some 85 percent of DHS employees are considered “essential workers” who would remain on the job – performing the vital functions for which the department was created – even if a new funding bill is not approved. President Obama and Senate Democrats claim to want a “clean” bill and that is exactly what the House has sent them. It is the president who is politicizing the Department of Homeland Security by conscripting its budget and employees to the task of carrying out his political agenda instead of protecting the nation’s vital security interests. Congressional Republicans must take a principled stand firm in defense of the defunding language already approved by the House. The battle shaping up over DHS spending is not about “divisive political issues,” as Senate Democrats suggest. Rather it is about protecting both the Constitution’s Separation of Powers doctrine and DHS’s ability to protect the nation from attack – both of which would be placed at great risk if the president is allowed to implement his amnesty program.